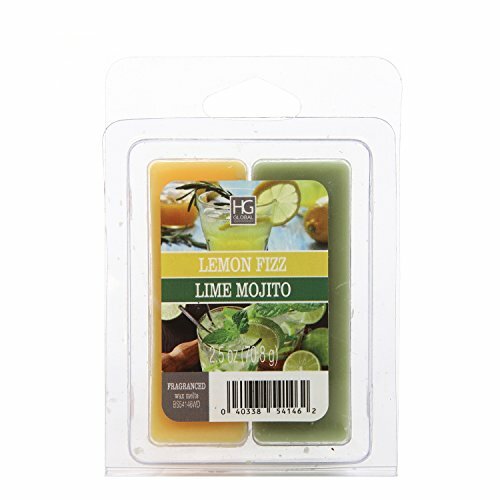 PRODUCT: Hosley's Set of 6 Dual Pack Lemon Fizz/Lime Mojito Wax Cubes- 2.5oz. USE: These are perfect for adding a decorative touch to any room's decor. When heated, they will diffuse a pleasant Lemon Fizz/Lime Mojito fragrance into the air. Perfect for everyday use, wedding, events, aromatherapy,Spa, Reiki, Meditation, Bathroom setting. MEASUREMENTS/MATERIAL: Made from essential oils fragranced wax, each package is 2.5 oz. and a set of six with your order.